Elvis Takes a Back Seat by Leanna Ellis. (Broadman & Holman Pub, paperback, 320 pages, ISBN 0805446966 / 978-0805446968). Wees Niet Wreed (Don't Be Cruel) by John Schoorl and Kees 't Hart. (Uitgeverij Nijgh & Van Ditmar, 140 pages, paperback, ISBN: 90-388-9033-8, Poetry). Elvis Lives On! by Lerma Alcairo Sundita. (paperback, 112 pages, ISBN: 143434083X / 978-1434340832). Elvis Aloha From Hawaii - The Day Elvis Came Closest to Japan by Toshiji Kizaki. Guia Musical de Elvis Presley by John Robertson. (Grupo Editorial Tomo, 124 pages, paperback, ISBN 9706663509 / 978-9706663504, Spanish ). Ancestors of Elvis Aaron Presley 50 Generations by Lorina Bolig. (CreateSpace, 806 pages, paperback, ISBN 1434840689 / 978-1434840684, updated version). (Saddleback Educational Publishing, Inc., 25 pages, paperback, ISBN: 1599052210 / 978-1599052212). Elvis And The Colonel - A Christmas Carol by Brian Springfield. (Blue Freckle UK, paperback, 80 pages, ISBN: 0-6151-8651-3 / 978-0-6151-8651-1). Elvis: the Fairy Tale by Jean Elizabeth Ward. (Lulu Press, paperback, 184 pages, ISBN: 1-4357-0235-2 / 978-1-4357-0235-6, poetry). Words 10 by Dark Moon Publishing. (Dark Moon Publishing, 40 pages, paperback). In Search of Elvis: A Journey to Find the Man Beneath the Jumpsuit by Charlie Connelly. (Abacus, paperback, 272 pages, ISBN 0349119007 / 978-0349119007). Elvis Presley: Movies ICONS: The Life and Times of the King by F.X. Feeney and Paul Duncan. (Taschen, 192 pages, ISBN: 3822823236 / 978-3822823231). (paperback, 180 pages, Dutch translation of The Gospel Side of Elvis). Elvis in the Beat of the Night: True Stories of Elvis and His Police Buddies by Bob Ferguson. The King Of Rock 'n Roll. Leaves Of Elvis' Garden by Larry Geller. (Bell Rock Publishing, paperback, 192 pages, ISBN: 0-9764350-0-4 / 978-0-9764350-0-6). Qui A Tue Elvis? - Mort(s) D'un Roi by Nikola Acin. (Cahiers du Rock, paperback, 144 pages, ISBN: 2-916560-07-6 / 978-2-916560-07-6). Elvis Portraits by Joe Tunzi. (JAT Publishing, hardback, 112 pages, ISBN: 1888464186). Elvis : Behind the Scene Accounts about the Making of Nine of Elvis Presley's Films: Frame by Frame by Bill Bram. (WingSpan Press, paperback, 378 pages, ISBN: 1-59594-220-3). Elvis: From Memphis to Hollywood by Alan Fortas and Alanna Nash. (Aurum Press Ltd, paperback, 322 pages, ISBN: 1-84513-322-6 / 978-1-84513-322-1). I Thought Elvis Was Italian by Domenico Capilongo. (Wolsak & Wynn Publ, paperback, 88 pages, ISBN: 1894987225 / 978-1894987226). Who Was Elvis Presley? by Geoff Edgers. (Grosset & Dunlap, hardback, 112 pages, ISBN: 1435254996 / 978-1435254992 ; children's book, re-issue). The King by Rich Koslowski. (Edition 52, paperback, 226 pages, ISBN: 3935229593 / 978-3935229593 ; German Edition). Suspicious Minds by Christy Barritt. (Kregel Publications, paperback, 240 pages, ISBN: 0-8254-2540-9 / 978-0-8254-2540-0). The Life And Times Of J.D. Sumner by Bob Terrell. All Shook Up by Shelley Pearsall. (Knopf Books for Young Readers, hardback, 272 pages, ISBN: 0-375-83698-5 / 978-0-375-83698-9, fiction). Not So Quiet on the Set: My Life in Movies During Hollywood's Macho Era by Robert E. Relyea and Craig Relyea. Sun King: The Life and Times of Sam Phillips, the Man Behind Sun Records by Kevin and Tanja Crouch. (Piatkus Books, hardback, 256 pages, ISBN: 0749951745 / 978-0749951740). 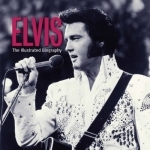 Elvis: The Illustrated Biography by Marie Clayton. (Transatlantic Press, hardback, 224 pages, ISBN: 0955794919 / 978-0955794919). Jesse & Elvis by Vere McCarty (Author), John Labovitz (Designer), Michael Smith (Editor). (Fast Books, paperback, 124 pages, ISBN: 0979473616 / 978-0979473616, novel). All Shook Up - The Life and Death of Elvis Presley by Barry Denenberg. (Paw Prints, ISBN: 1435298233 / 9781435298231, children's book). (AuthorHouse, paperback, 408 pages, ISBN: 1434383296 / 978-1434383297). (AuthorHouse, hardback, 408 pages, ISBN: 1434385612 / 978-1434385611). Up Close - Elvis Presley by Wilborn Hampton. (Puffin Books, paperback, 208 pages, ISBN: 0142411485 / 978-0142411483, re-issue). Elvis: '68 at 40 Retrospective by Steve Binder. (JAT Productions, hardback, 122 pages, ISBN 1-888464-19-4). Elvis Live at Del Webb's Sahara Tahoe by Sue McAsland and Joseph A. Klein. (Praytome Publishing, 144 pages, hardback, ISBN 3-00-024816-1 / 978-3-00-024816-0). (BookSurge Publishing, 186 pages, paperback, ISBN 1439203733 / 978-1439203736). (Beekman Books Inc., paperback, ISBN 0846443899 / 978-0846443896). Me and a Guy Named Elvis: My Lifelong Friendship with Elvis Presley by Jerry Schilling. (Viking, paperback, 384 pages, ISBN: 1592403050 / 978-1592403059). Elvis: Something For Everybody by Joe Russo and Steve Barile. (That's All Right! Publishing, hardback, 124 pages, ISBN: 0-615-22053-3 / 978-0-615-22053-6). The Man Who Made Elvis Laugh - A Life In American Comedy by Sammy Shore. (TCB Joe Publishing, paperback, 312 pages, ISBN 0977894584 / 978-0977894581). (TCB Joe Publishing, hardback, 312 pages, ISBN 0977894592 / 978-0977894598). Inside Love Me Tender by Megan Murphy. (Elvis Unlimited, paperback, 152 pages, ISBN: 87-91975-08-5 / 978-87-91975-08-0). My Way to Memphis: Wie ein Lebenstraum wahr wurde by Maik Ross. (Books on Demand, paperback, 108 pages). My Way to Memphis: Auf den Spuren von Elvis by Maik Ross. (Books on Demand, paperback, 120 pages). Elvis Presley by Marie Clayton. (Pulteney Press, hardback, 96 pages, ISBN 1906734003 / 978-1906734008). Elvis Presley - Desert Storm: The Shattering Of A Myth! by Darrin Lee. (paperback, 220 pages, 2nd Edition). From The Dark To The Light: The Bootleg Discography by Mario Coradduzza. Elvis Presley: The Patriot - A Man's Love Of God And County by Darrin Lee. Elvis: Your Personal Fashion Consultant by Michael Feder and Karan Feder. Elvis Presley - Icons of our Time by Alison Guantlett. (Pulteney Press, hardback, 96 pages, ISBN: 190673402X / 978-1906734022). (Igloo Books Ltd , hardback, 304 pages, ISBN: 1848172826 / 978-1848172821). Der King in Deutschland 1958 - 1960 by Heinrich Burk and Hans-Ulrich Elter. (Oldenburger BPlusU-Verlag, hardback, 170 pages, ISBN 3939870552 / 978-3939870555). The King in Germany 1958 - 1960 by Heinrich Burk and Hans-Ulrich Elter. (Oldenburger BPlusU-Verlag, hardback, 170 pages, ISBN 3-939870-54-4 / 978-3-939870-54-8, English Ed.). 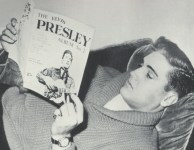 The Elvis Encyclopedia by Adam Victor. (Overlook Press, hardback, 598 pages, ISBN: 1585675989 / 978-1585675982, US Edition). (Gerald Duckworth & Co Ltd, hardback, 598 pages, ISBN 0715638165 / 978-0715638163, UK Edition). Waiting For Elvis by David Elias. (Coteau Books, paperback, 256 pages, ISBN 1550503944 / 978-1550503947, novel). 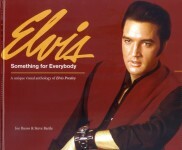 Elvis: Still Taking Care of Business by Sony West and Marshall Terrill. (Triumph Books, paperback, 400 pages, ISBN 1600781497 / 978-1600781490, re-issue). Elvis Ultimate Gospel by Hal Leonard Publishing. (Hal Leonard Publishing, paperback, 88 pages, ISBN 1423445767 / 978-1423445760). 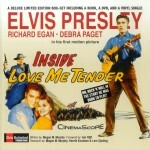 Love Me Tender: The Story Behind The World's Best-Loved Song by Max Cryer. (Frances Lincoln Publishers Ltd, hardback, 192 pages, ISBN 0711229112 / 978-0711229112). 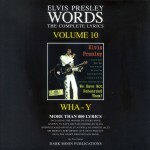 Elvis A. Presley / druk 1: muziek, mens, mythe by Marc Hendrickx. (Dutch Filmworks Bv, hardback, 695 pages, ISBN 9085104149 /978-9085104148). Enciclopedia delle Canzoni by Livio Monari. Elvis, Le King en Devenir by Alfred Wertheimer. (Monin Yves, 207 pages, ISBN 291009703X / 978-2910097035. First released in 1995.). (l'Atalanta, paperback, 128 pages, ISBN 2841724522 / 978-2841724529). (Lulu Press, paperback, 37 pages, ISBN 1-4357-3905-1 / 978-1-4357-3905-5). (Rainbow Rhapsody Press, hardback, 80 pages). (JAT Productions, hardback, 112 pages, ISBN 1-888464-20-8 / 978-1-888464-20-7). (Le Castor Astral, paperback, 864 pages, ISBN 2859207279 / 978-2859207274). (CreateSpace, paperback, 164 pages, ISBN 1441404252 / 978-1441404251). (Uitgeverij Aspekt BV, paperback, 337 pages, ISBN 9059117085 / 9789059117082). (Lulu Press, paperback, 534 pages, ISBN 1-84799-231-4 / 978-1-84799-231-4).